With the excavation of Trench 6 in Bone Passage now complete, we have included in this update some of the latest finds including bone pins and a significant number of items manufactured from steatite, or soapstone. Most of the finds were recovered from the base of stairwell, in a tight distribution around the two lower steps that form this structure, or a paved walkway associated with an earlier access into the cave. The image below shows a group of pins that were recovered from a gap between two paving slabs in the cave (see previous update in the news section), which exhibit strange wear patterns around their tips. The opposite ends of the pins, which appear to have been manufactured from antler, are more crudely shaped and often have a angled, cut end. 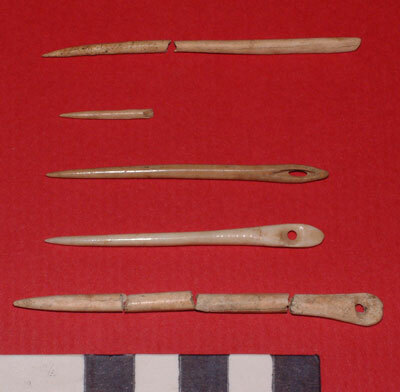 Two similar pins were recovered from Trench 1 in Bone Passage during excavations in 2004, and these are shown below. When first recovered, it was thought that the pin showed above was some form of dress fastener with a delicately carved head. However, during the analysis of finds from the fieldwork by the National Museums of Scotland, Fraser Hunter suggested that the pin may have been used in some form of craft process including the use of thread. After discovery of the second pin, shown in the image below, it did appear that the tools had been used in such a process, such as picking out threads, possibly in the manufacture of woven fabrics. However, the tools would benefit from use-wear analysis and experimental archaeological techniques in order to allow us to interpret these finds. 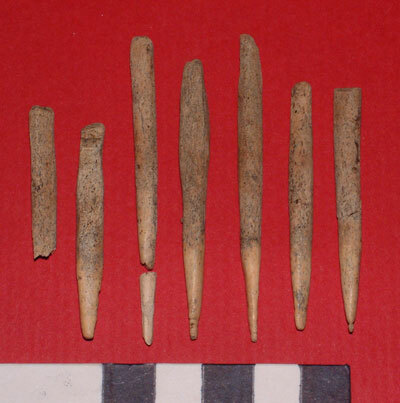 The image below shows just some of the finer and more complete pins and needles manufactured from bone, recovered from Trench 6. In addition to these, we have found many broken and fragmentary pins, some of which have also been burnt white through contact with fire. The only other location at High Pasture’s where we have found such fine pins and antler work is in Trench 2, within the natural hollow immediately outside the former cave entrance, where we had recovered the three superimposed hearth settings. Here, the bone and antler artefacts had been inserted into the ash layers surrounding the hearths. 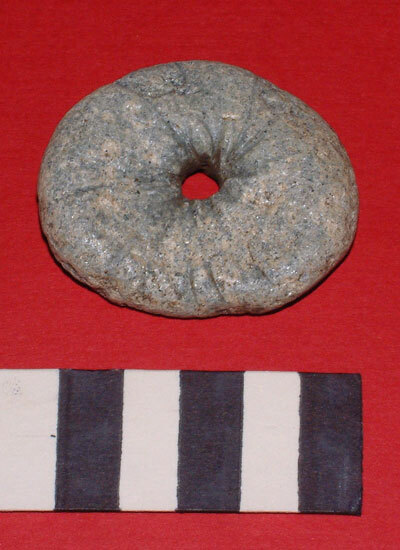 During the excavation of Trench 6 we have recovered a significant number of small finds manufactured from steatite, or soapstone, including spindle whorls and other forms of circular disc. Again, most of these items were found in a tight distribution in close proximity to the bottom steps of the stairwell, although a small number were recovered in isolation within the trench. The item shown above has a rounded outer edge and hour-glass-shaped hole through the centre, while shallow grooves radiate away from this central hole. Is it possible that this item, like the pins above, was associated with the manufacture of thread - hence the grooves from wear. The soapstone would provide a lubricating-type quality in such a process. 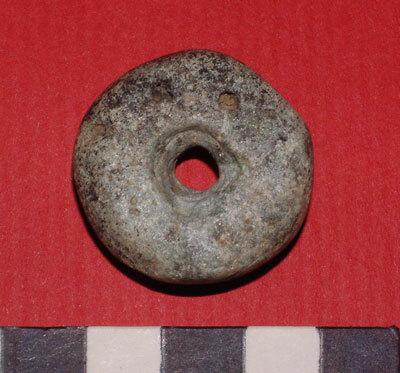 The possible spindle whorl shown above has a parallel-sided hole through the centre and a shallow groove around the circumference, which may be some form of decoration. The drawings above by Marion O’Neill show the item described above with radiating lines and a second, smaller soapstone disc-shaped item, which also has a central hole and chamfer on one edge. This may be a type of bead, or other form of decorative item. 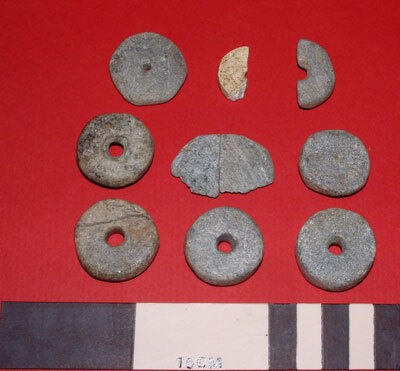 However, the major group of steatite/soapstone items recovered from Trench 6 appear to be spindle whorls. 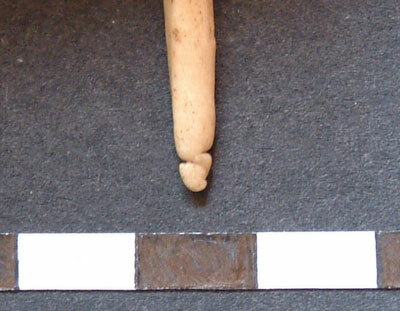 The image below shows a group of these items found in the lower deposits of Trench 6. The item above is manufactured from a pale-coloured soapstone and is quite regular in its form. The item has a parallel-sided hole through the centre. 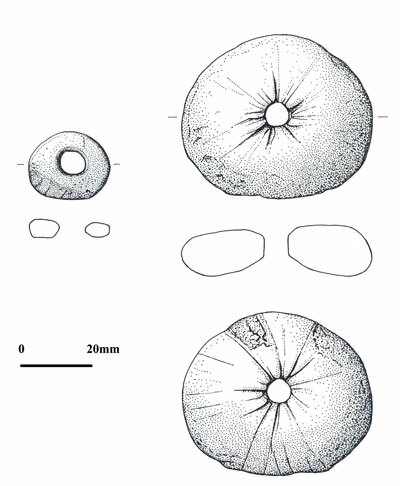 The possible spindle whorl shown above was never completed - a dimple in the centre of the object appears to show where the hole was going to be bored through. 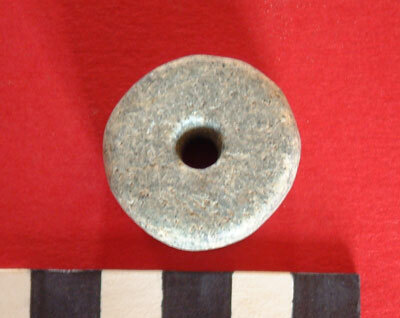 The spindle whorl, or disc, shown above appears to have some form of decoration on the face, which is intermittant over the object. The item has an hourglass-shaped hole through the centre, while the overall appearance of the item suggests that it may have been subjected to high temperatures in a fire. This may have caused the damage to the decoration on the object. 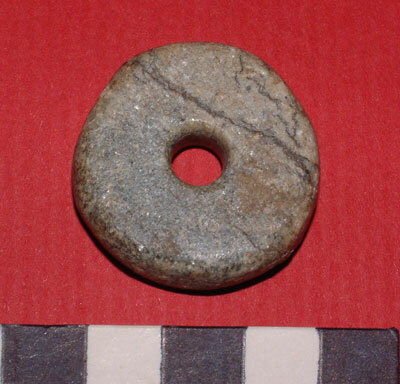 This spindle-whorl has been manufactured from a particularly fine piece of soapstone, with inclusions that has formed the decorative patterning. Finally, the two items above have been broken in half, possibly through use or as a deliberate act of putting the items out of use. 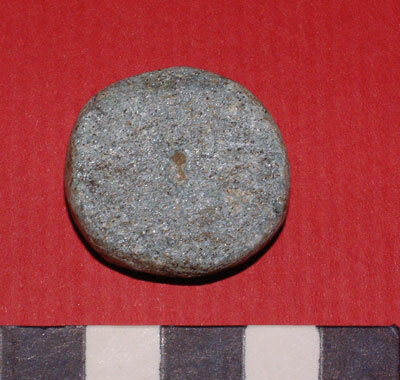 We have recovered fragments of rotary quern from the site that have been broken in a similar manner. 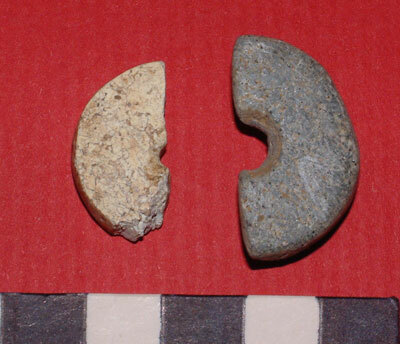 The item on the right in the image has an hourglass-shaped hole through the centre, while the item on the left - which appears to have been manufactured from a very pale-coloured and highly decorative form of soapstone. The item has been highly polished all over and has a very small diameter hole through the centre. It is possible that this may have been a form of bead or pendant. 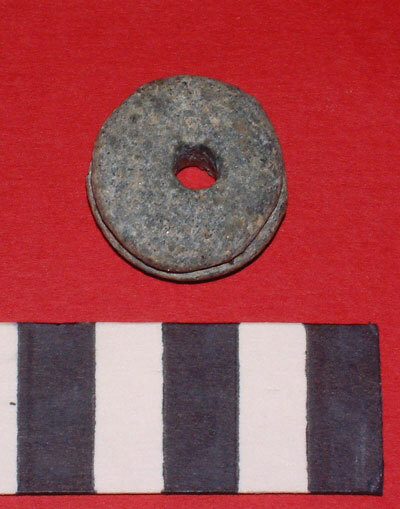 While most of these items appear to have been manufactured as spindle whorls, which also fits with the craft industries indicated by other finds in the cave such as pins, needles and the potential threading tools, there is a possibility that they may have been manufactured to represent miniature rotary querns - another type of item for which we have several examples recovered from the High Pasture’s site. Other finds from the base of the stairwell include a large granite quern rubber, a small flat whetstone and the fine whetstone/hone stone combination tool seen below. 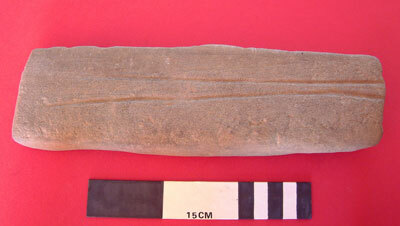 While the outer edges of the sandstone tool have been used for sharpening possible iron objects, the two distinct grooves running across the flat face of the item may have been used to sharpen bone points. The sandstone has a soft, gritty texture that would have provided a similar surface to that of volcanic pumice, the more usual material for working bone and antler. The iron adze or axe shown above still retains a portion of the original wooden handle, which has been mineralised and preserved due to the iron within the composite object. 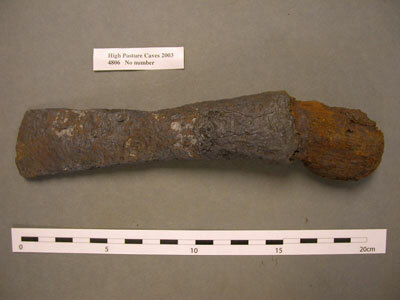 The tool is socketed, much in the same way as the earlier Late Bronze Age weapons and tools were produced, in which the wooden haft could be inserted. 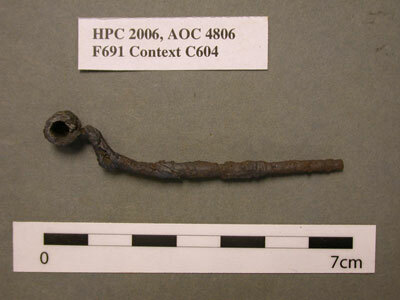 The image above shows a fine iron pin, complete with crooked neck and eye. 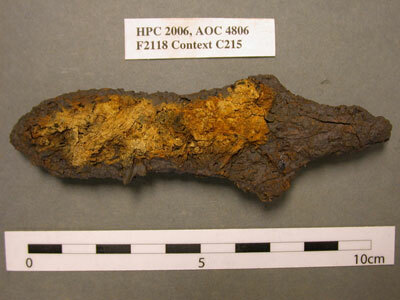 Shown in the image above are the remains of an iron dagger complete with a part of the organic scabbard, which is possibly manufactured from wood. Items manufactured from iron are relatively rare on prehistoric sites due to the corrosive properties of the generally acidic soils, therefore, we are fortunate to be assembling a growing range of iron objects from the High Pasture’s site. From our excavations in Bone Passage over the past three years, especially within Trench 6 at the base of the stairwell, it is becoming clear that we have several types of artefacts that have been deposited at the site which share very similar characteristics; both in the materials from which they are manufactured and in their potential function. For example, the common forms of artefact found within the cave include possible spindle whorls and bone pins, all of which may represent craft industries that were taking place in nearby settlements. It is also important to note here that the same types of artefact have been deposited within the cave over a considerable period of time (based on ceramic evidence and stratigraphic associations on site). Other items include metalworking residues, including large slabs of sandstone with attached iron deposits, hammer scale and slag. At the moment we cannot be certain if these activities are taking place on site, or if the materials are being imported into the site as some form of offering. However, it is possible that the material we are recovering from the cave is associated with the repeated deposition of items associated with everyday life; offered, so that the craft industries and processes that these items represent continue in domestic life. We also have to take into consideration the evidence we have recovered for burnt and cremated bone, animal and possible human bone, that may be associated with cremation at the site. 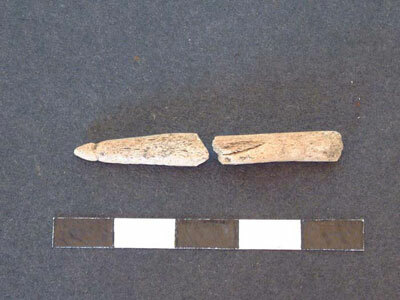 As mentioned above, we have also recovered fragments of bone pins, the burnt spindle whorl, copper-alloy items and glass beads - all of which appear to have been subjected to high temperatures. Could these be the remains of offerings utilised in the cremation process at the site? Hopefully, further fieldwork and analysis will help us to unravel some of these questions and theories. Really enjoyed helping out at the high pasture dig for the day in September. Had a geat opportunity to visit the cave below.. very scary but an amazing experience. Thanks lots to the workers on sight for a great day. for how to use one! I am the Head of Antiquities section in Zanzibar Tanzania.I was participated in many archaeologgical researchs in my country,but most interesting one was take place last year.Tjis was cave archaeological work in Zanzibar where we found the history of this Island went bach till 20000 years BC. We found the stone age period and all of this artifacts is stored in out department.National and International team was participated in thiat archaeological work. I like archaeology but unfortunatly I do noit have an opportunity stuiduy that discipline this is due to the lack of sponsership. Keep it up all of you.